How to Copy and Play DVD on iPad mini? When get iPad mini in hand, it is fully proved that the 7.9 inch display more than measures up to the complete iPad experience which enables watching videos in vivid detail. However, it is a pity that the iPad mini still has no built-in DVD drive. That is, it is unable to directly load DVD on iPad mini. In this case, in order to successfully play DVD on iPad mini, there is no other way but to convert DVD to iPad mini and iTunes supported format, then transfer the converted DVD movies to iPad mini by via of iTunes. The following article will introduce a powerful DVD to iPad mini Converter and a detailed tutorial on how to convert DVD movies to iPad mini supported format so as to copy DVD to iPad mini for playback on the go. Besides acting as a DVD to iPad Converter for iPad, iPad 2, iPad 3, iPad 4, iPad Mini and iPad Air, Bigasoft VOB to iPad Converter is also a professional DVD to iPad mini Converter. It can fast convert all kinds of DVD videos to iPad mini supported format for successfully copy and play DVD on iPad mini. Convert DVD in whatever video formats to iPad mini supported format like DVD VOB to iPad mini, DVD MPEG-2 to iPad mini, DVD AVCHD to iPad mini and more. Convert various DVD movies to any other video or audio format like WMV, AVI, MKV, MPG, DV, ASF, WebM, RM, WMA, AIFF, MP2, OGG, FLAC, AU, WAV and etc. How to Convert DVD to iPad mini? The following is a step by step guide on how to rip and convert DVD movie to iPad mini supported video or audio for DVD playback on iPad mini. 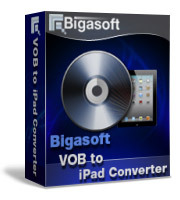 Free download the ideal DVD to iPad mini Converter - Bigasoft VOB to iPad Converter (for Mac, for Windows), install and launch it on your Mac (Mountain included) or Windows (Windows 8 included). Click the "Open DVD" button to locate and load DVD movie, DVD folder or DVD ISO files to Bigasoft VOB to iPad Converter. All the added DVD files will be presented on the panel, and you can preview your DVD video on the left preview window. Click the " Profile" drop down arrow to select "iPad mini H.264 Video (*.mp4)" from "iPad" category. Click the "Browse..." button to set the destination folder for saving the converted DVD video. Click "Convert" button at the bottom right to start converting DVD to iPad mini supported video format, it will be finished with high output video quality and fast conversion speed. When the DVD to iPad mini format conversion is completed, simply click "Open folder" button to get the converted DVD movies, and then transfer them to iPad mini by via of iTunes for easy playback DVD on iPad mini on the go!